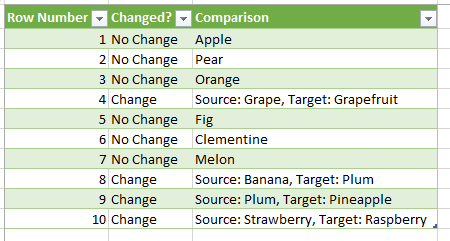 A few weeks ago I wrote a post about comparing the contents of entire tables in Power Query, and a question came up in the comments about how you might go about comparing values in columns rather than whole tables. Of course this prompted me to investigate how different types of comparison might be done – and here’s the blog post with the results of the investigation. Fairly self-explanatory, I think. List.Difference() finds the items that are in one list and not another: List.Intersect() finds items that are in both. In fact it’s probably more interesting to look at how I’ve generated the output. Table.FromRows() returns a manually constructed table. The CombineWithComma step uses Combine.CombineTextByDelimiter() to return a function that turns all of the items in a list into a single, comma-delimited piece of text, and I then use that function inside each row of the table I’m returning to get a readable version of what List.Difference() and List.Intersect() return. 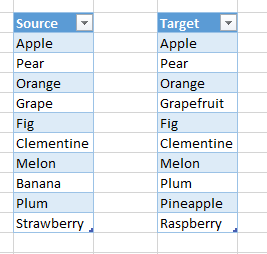 Again I’m turning each table into a list, and then I’m using List.Positions() to generate a list of integer values from 0 to 9 representing the index of each item in the source list, then using List.Transform() to iterate over each item in this list and compare the values at the given index in the source and target list. 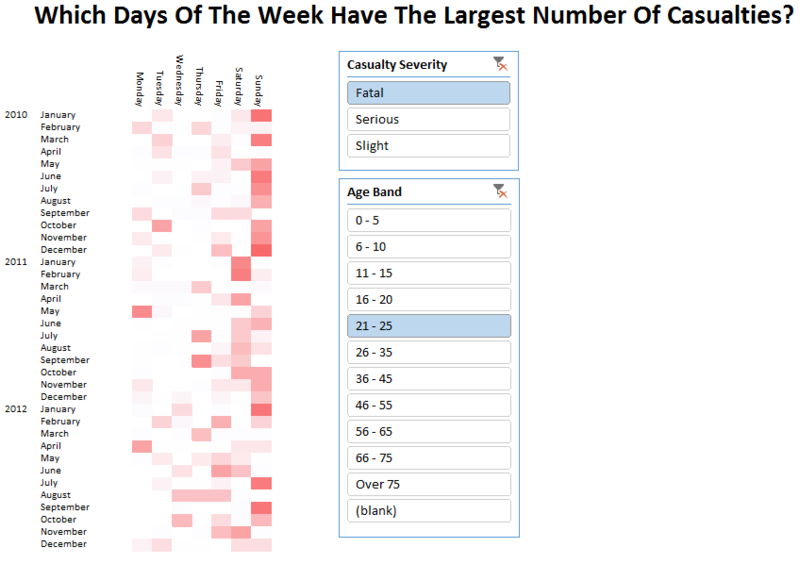 Frankly, an even easier way of doing this might have been to import both tables in separate queries, add an index column to both of them using the Insert Index Column button, then join the two tables together on the index column using the Merge button and then finally create some custom columns to do the comparison. This is certainly how any end-user would do it, but the resulting code is a bit less elegant I didn’t learn anything interesting about M from doing it that way. I’ve left the example in the demo workbook, which you can download here. 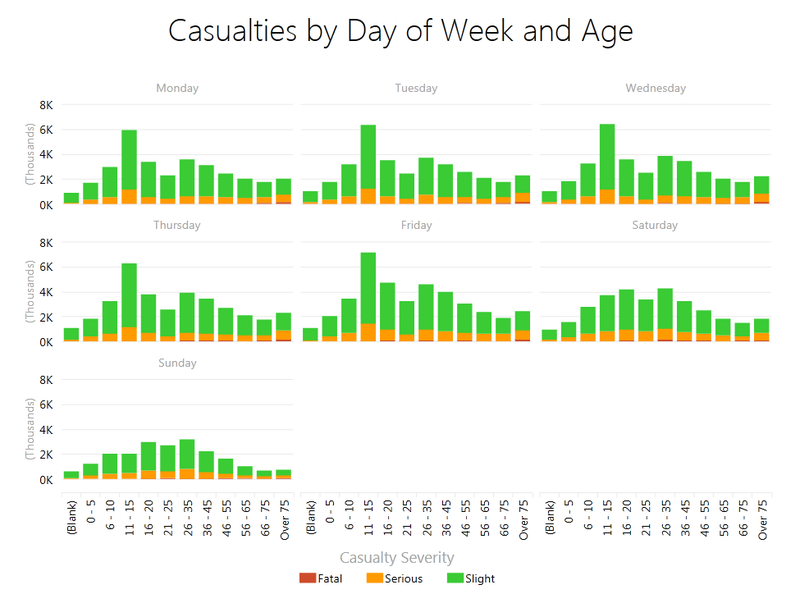 CLICK HERE TO VOTE FOR ME IN THE POWER BI COMPETITION! EVEN IF YOU’VE VOTED ALREADY YOU CAN DO SO AGAIN! 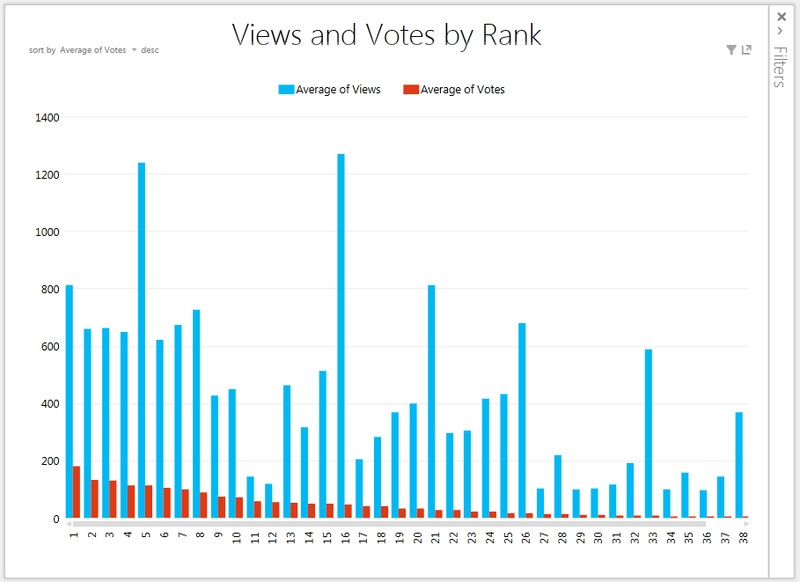 Analysing Voting In the Power BI Competition – With Power BI! 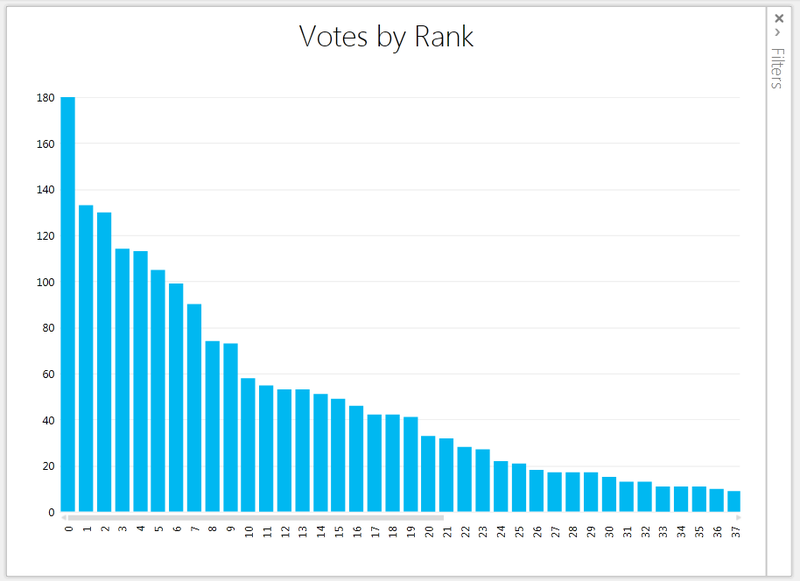 As I mentioned the other day, the public voting round of the Power BI competition has now started and the entrants are now competing for a place in the top ten and a whole bunch of cool prizes including XBoxes and Surface Pros. Having entered a demo myself I’m naturally very keen to see how I’m doing, but unfortunately doing this is a bit of a pain – you have to go to www.powerbicontest.com, click on the Entries tab, sort them, find your entry, and so on… So I thought to myself, isn’t there a better way? 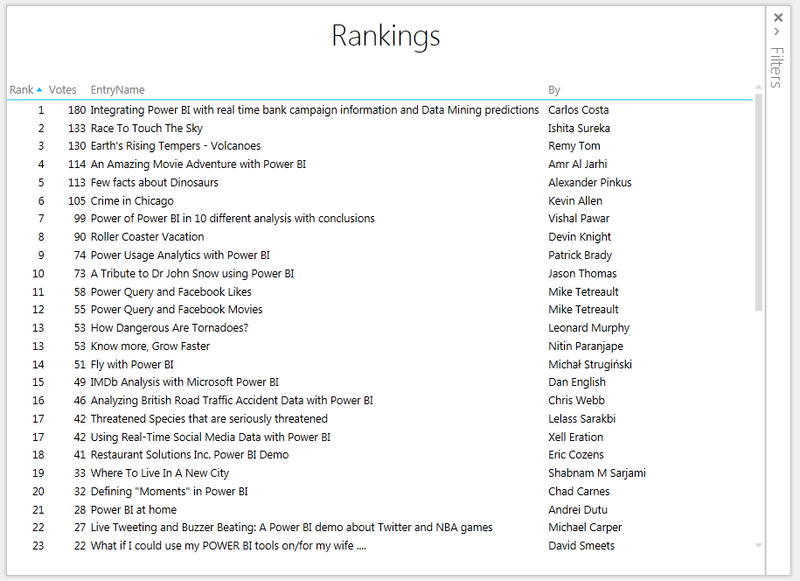 And of course there is… using Power BI! You can download the entire workbook here. I’ll warn you, the code isn’t pretty but it does the job and it’s got a few interesting features in for all you Power Query fans. Now let’s have a look at what the data shows. As you can see, at the moment Carlos Costa is way out in front with a massive 180 votes; after that there’s a group of people fighting for a top five finish; and after that there’s a large group of people who might just squeeze into the lower reaches of the top ten. I’ve got the second largest number of views, but I’m in the middle of the pack. The problem for me is that I was one of the first people to enter and most of my views were well before voting opened; unfortunately there’s no way of knowing how many views each entry had after voting opened so I can’t say for sure what’s going on here. Certainly Alexander Pinkus submitted his demo “Few Facts About Dinosaurs” around the same time as me, has around the same number of views, and he’s currently ranked number 5. From that I can only deduce that his demo is better than mine (and having watched it I can say it is very good); he certainly has more exciting subject matter. Who doesn’t love dinosaurs? There are several other demos that have got particularly eye-catching subject matter and/or titles and they’re also doing well. 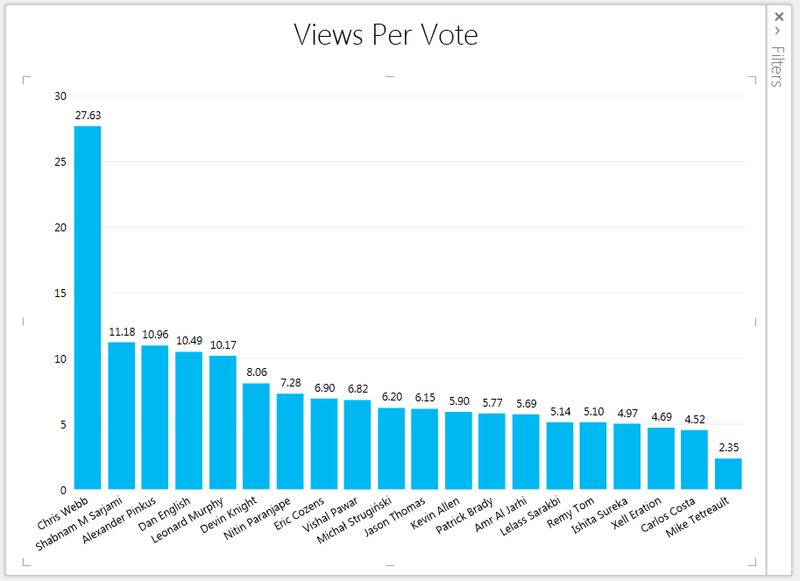 I think this makes it a little easier to disregard outliers like me, and it’s probably fair to say that there is some kind of link between views and votes, at least for those in the top 20. You can see how badly I’m doing in this respect, despite my begging and pleading both here and on Twitter; conversely you can see that Mike Tetreault at the other end is obviously very good at getting his vote out. I would like to say at this point that it’s tempting to moan and complain that people have ‘cheated’ and got their friends, family and colleagues to vote for them. To be honest, I think that everyone who’s got any significant number of votes will have ‘cheated’ like this to some extent. I certainly have – I’ve used my blog and other social media to try to get as many votes as possible. Indeed this post itself is a ruse to try to get more votes! At the end of the day the whole point of this competition is for Microsoft to get as many people as possible to see Power BI, so more people want to buy it. Therefore this mad scramble by entrants to get as many votes as possible will benefit all of us in the end. Anyway, by the time you read this post there’s a strong chance that the patterns here will have changed completely. It’s a shame there isn’t more data available to play with – it would be great to have the time and date of each vote cast, and even the location of the person casting the vote. Given that you have to have a Facebook account to vote I suspect that someone somewhere does have all of this data, and more… so I wonder if they’re using Power BI too? One feature that was released in the December update for Power BI but got lost in all the fuss over Q&A was the ability to favourite a report and have it appear in your own “My Power BI” site. In fact there are several interesting things to see here, and while they are documented I thought it would be useful to show some screenshots. 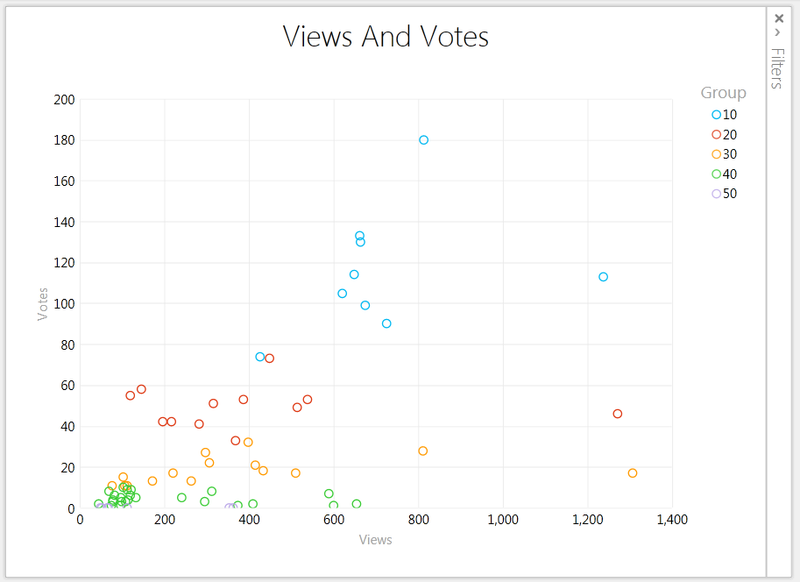 On the main Power BI page, you can now click on the ellipses at the bottom right hand corner of a report to favourite it. This means it will appear in your own “My Power BI” site. I hadn’t really noticed this page before; you can find a link to it in the top right hand corner of the screenshot above. 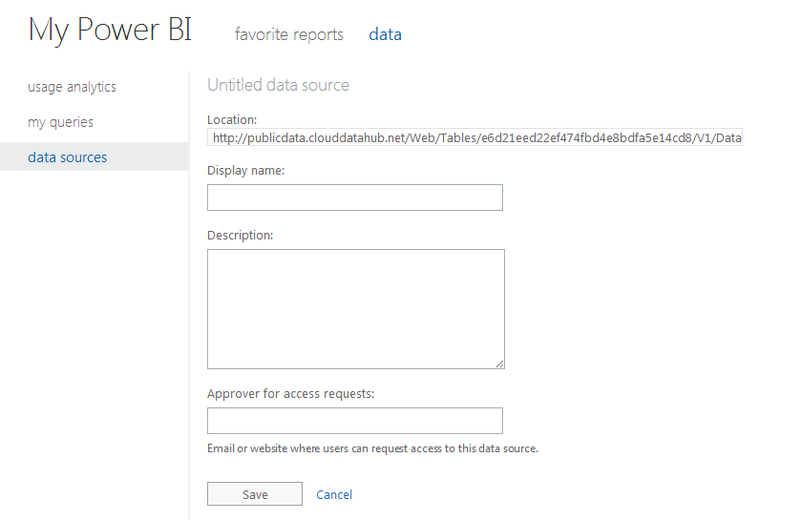 When users either connect to various external and internal data sources or share queries using Power Query, metadata for the connected data sources or the underlying data sources for the shared queries respectively gets created in the cloud-based metadata repository of Power BI for Office 365. The metadata of such data sources become available in the Manage Data portal. 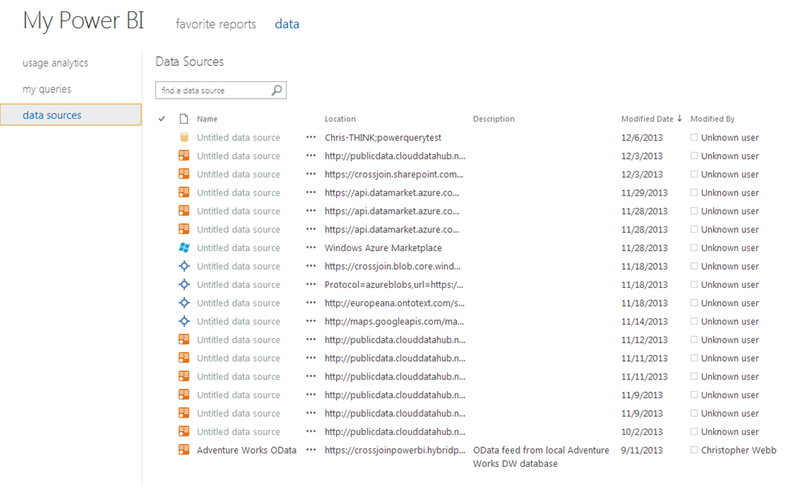 The Manage Data portal displays all the data sources available in the cloud-based metadata repository of Power BI whether or not you have access to the data in the data source. The data source listing displays the name, location, description, the user who last modified it, and the date when it was last modified. I’ve tested this on tables sourced from SQL Server and quickly ran into a bug that crashed Power Query, but it seems as though Value.Equals() returns True when you pass it two identical tables and False when you pass it a table and a view which is just a SELECT * from that table. I wonder if there’s some extra metadata that allows Power Query to tell the difference between a table and a view? More research needed I think. Overall this seems quite a handy trick to know about. This post has barely scratched the surface of what you can do with Value.Equals() though – you can compare any two values, not just tables, and you can specify your own function to do the comparison. As with so much of Power Query there’s a lot to learn… but that’s what makes it so fun!